A Capellan Confederation counter-attack launched during fourth wave of Operation Rat, Operation Riposte was intended to destroy under-defended supply depots on six worlds vital to the Federated Suns continued involvement in the Fourth Succession War. Unbeknownst to the Capellans however, the supposed Achilles Heel they were targeting as part of Riposte was in fact false intelligence designed to convince them to strike as part of Operation Ambush. Outcome: The battle was fought in two places. The first engagement took place at a number of warehouses. The Capellan commander have trust in the capabilities of his troops. The defending Delta Company of the Light Guards split the attacking force. The supporting Hovercraft had no chance to help their comrades. The Capellan forces were beaten in close combat. The other fight took place several hundred kilometers away. The march of the Capellans was uncontested. The Guards and the Rangers lied in an ambush out of sight of the attackers. The CO discover the trap and fight to the end against the defenders but the superior numbers began to count and in a final push all remaining CCAF forces were defeated. Outcome: The Rangers were tasked with the mission to capture all equipment with value and destroyed the rest that could not be transported. The 4th Tau Ceti had luck when they stormed the Homebase of the Cadre. Only 12 'Mechs and some infantry regiments defended the base. They had no chance against such experienced attackers. The Rangers discover the hidden lab and began to plunder it. The main force of the Cadre were on a training cycle outside of the camp. The Cadre formed a company of the experienced soldiers which tried to block the Capellans in the withdrawal. The mercs could liftoff and the CO of the cadre were killed in action. Outcome: The Warrior House Hiritsu meet the Striker Regiment. First the ELH sent their conventional force against them. The fight cost them 12 'Mechs. Then the Horses 'Mechs began to get in the battle. The House Warrior fight to the death. A force of 5 company strength were tasked with the destruction of the warehouses near Jamou. The CO tried to use speed to rush in and retreat after the demolition. But they had not excepted 9 conventional battalions supported through 3 'Mech companies. The Capellan officer order his troops back to the awaiting dropships. Some troopers fight the Davions and were killed. These actions cost them 12 'Mechs. The remaining forces were killed through six companies of the Guards. Another force containing forces of the Trimaldi's Secutors and Laurel's Legion landed on the planet. When forces of the Crucis Lancers meet them, the troops act differently. The warrior of the Legion surrender and the members of the Secutors fight. Both units began to fight each other and the Lancer calm the situation with force. The Legion changed the side. Outcome: A taskforce of 3 'Mech companies (one each of Kerr's Intruders + McCrimmon's Light Cavalry + MacGregor's Armored Scouts were ordered to destroy the warehouse complex at Zander's Light. The supporting conventional run in the main forces of 4th Guards. The 'Mechs were beaten by the Davion 'Mechs with easy. The Capellans surrender. The other taskforce use a unconventional tactic (Avalanche drop). They dropped their force at the top of the defending 4th Lancers. The Capellans discover that the warehouse were empty. They decided to hunt the Davions. The 3 defending companies began to retreat as fare as possible the CCAF warrior followed them blindly. The remaining 6 'Mech companies and conventional forces of the lancers blocked the retreating line. The CCAF forces returned and choose to fight to the death before surrender. Outcome: Once fielding 3 full regiments the Voltiugeurs could save only 4 battalions from the slaughter house of Tikonov. After same time of recovery this units were tasked with the mission to secure or destroy all possible supplies of the AFFS on New Aragon. 3 different base were located and marked for destruction. Each taskforce consists of 4 'Mech companies support by conventional assets (6 infantry battalions + 3 heavy armor battalions). The 1st Taskforce attack Fort McMichael. The 'Mechs build the front and the flanks were protected by the other forces. The column run in a force of Davion Assault Guards (24 machines). The CO hoped to lure the Davion in a trap, but were trapped first from a flaking maneuver of the hovertank machines of the guards. With the support of fighters the 3 companies of CCAF troops were shattered to a handful of survivors. The 2nd Taskforce assaulted Grahamsville. The maps showed the CO a easy target at a riverside. But the normally small river were over his borders and the Davion engineers build a defense wall around the warehouses. The CCAF units tried to cross the river but had bad luck, because to bridges were destroyed. The taskforce were surprised by the New Avalon March Militia. The CO's of both sides were wounded and the ongoing fight shifted to the Davions. The Capellans make a last stand but only 3 lances surrender with some survivors. And finally, the 3rd Taskforce attacked Fort Ellison. The Aragon Border + 18 attached battalions were tasked with the defense of the complex. The approach were with some difficult but the main force were out of sight. The Capellans could destroy some supplies but the fierce fight with the Borderers changed their attitude. Hunted by 2 Mech units and without air support the Voltigeurs surrender after they saw no change o escape. Outcome: The 3 companies of the MAC were surprised by the presence of the Vegan Rangers Beta Regiment. The 2nd Battalion of the Rangers were attacked in a series of engagements by the Cavalry. When they realize that the defenders were stronger than expected the Mac warrior decide to go underground and harass the Davion forces the following months. The second group attacked a warehouse complex. The units land on two different sides. The Cavalry units were attacked by the 2nd Cobras, because the 1st Cobras fighting the Warrior House. 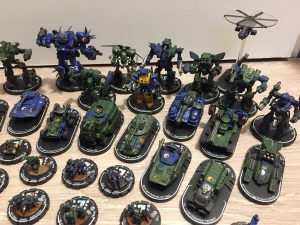 The CRC surrender after some loses and the overwhelming numbers of 'Mechs. The Warrior House lasted some longer but they decide differently. Choosing to fight a losing battle from the beginning, the unit faltered after heavy fighting. The last battle occurred between the Prefectorate Guard and the 1st Ceti Hussars. The two units meet in the past on different occasions. The CCAF unit pushed forward unsupported. The Hussars retreat and set ambushes at their way back. The 'Mech forces of the Capellan have a weight advantage. But the Hussar swiftness were a tactical surprise for the Guards. In a final battle the Guards fight to the death and the unit were annihilated. Outcome: The CCAF forces landed in the near of the AFFS base. The Capellans retreat after a short engagement with 2nd Chasseurs. The terrain worked for the attackers but after the Davion called their supporting mercs in the invaders meet their destiny in a fighting death. ↑ 1.0 1.1 1.2 1.3 1.4 BattlePack: Fourth Succession War, pp. 20-21 "Scenario 5: Operation Intruders Communion"
↑ 2.0 2.1 2.2 2.3 NAIS The Fourth Succession War Military Atlas Volume 1, pp. 88-89 "Operations Riposte and Ambush - Operation Riposte - Operation Ambush"
↑ NAIS The Fourth Succession War Military Atlas Volume 1, pp. 88-89 "Operations Riposte and Ambush - Overview"
This page was last edited on 26 May 2017, at 04:09.